Well I have to say that from a traders point of view I was very disappointed with the Northampton Balloon Festival that is held in Billing Aquadrome. To be frank its really not the place to try and sell Paella. Its just a big camp site where most of the people live in static caravans for most of the year and really have no need to pay for food as they cook it for themselves in their Caravans. The fact is though that ALL the traders be it food or otherwise had very little trade. Every trader that was attending was moaning about the lack of business and the fact that the Friday was sold to them as a trading day when it was really a set up day and we had no trade at all on the Friday.I won’t be going back to that show or to any other in Northampton’s Billing Aquadrome. The organisation was a total disaster. Why do I say this? Well they placed a 30 foot Fish and Chip trailer next to the venues permanent Fish and Chip shop! One word for that, crazy! The Balloons were over the other side of most of the traders and I was very disappointed with that too. Well enough of that for now. Below you will see some pictures taken on the Saturday morning at 6am as the Balloons took to the air. Enjoy! Balloon getting ready to fly at the Northampton Balloon Festival 2013. Balloons taking to the early moring sky at The Northampton Balloon Festival 2013. 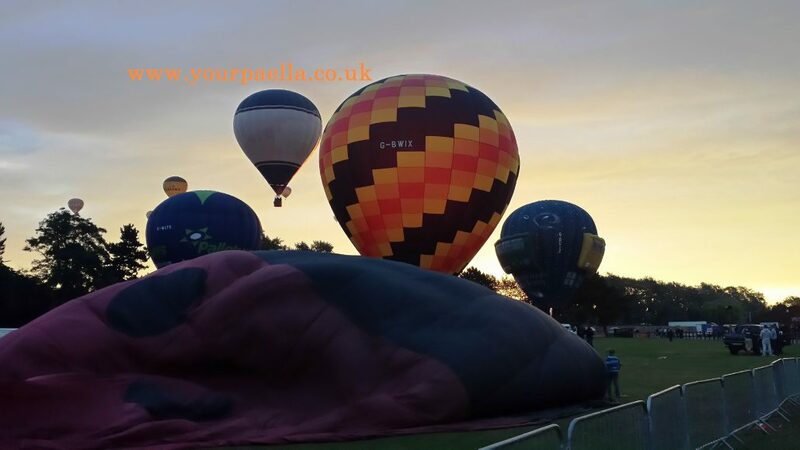 6am at the Northampton Balloon Festival 2013. Outdoor Catering. Paella party review.